Three up, two down with last week’s picks has the season record now at 57-17. Washington State and Colorado take the week off and a couple of rivalry games highlight the week twelve schedule. As always we first take a look back at the week that was. As the Huskies waltzed through a cup-cake non-conference schedule and even after their stumble in Tempe the thought has been until someone proves they are better, Washington owns the northern division. After falling to Washington State, the Cardinal bounced back with a victory over Washington that leaves those three teams with a chance to win the division two weeks left in the season. With a bye this week, the Cougars own their destiny with a win over Stanford in hand and the Huskies in Seattle next week. Fait accompli after dispatching Arizona the week before but official with the win over the Buffs, USC will represent the south in the conference championship game. Place kicker Eric Powell scored 15 of the Cougars points in the win at Rice-Eccles. The Khalil Tate legend just keeps growing. The sophomore quarterback completed only 5 of 7 pass attempts but shredded the Benny’s for 206 yards rushing on 16 carries – including a 71-yard TD. Running backs Nick Wilson and J.J. Taylor did a fair share of shredding too… Wilson for 101 yards on 17 carries and Taylor 129 yards with ten. Add it up and you’ve got 534 yards rushing allowed by Oregon State. Yikes. Remember when the Sun Devils throttled the Huskies in week six and that this was the year Todd Graham had the team to contend for the southern division crown? Remember how ASU always seems to unravel before that can happen? Rivalry games are always dicey and the case could be made this game in particular could become a trap game for the home team. USC has already clinched a spot in the conference championship game in spite of occasionally uninspiring play and that tendency could work to the Bruins advantage if the Trojans think they can mail this one in. Last week’s win over ASU could lend UCLA a bit of momentum as well. But in the end, USC is the better team and should prevail 35-27. 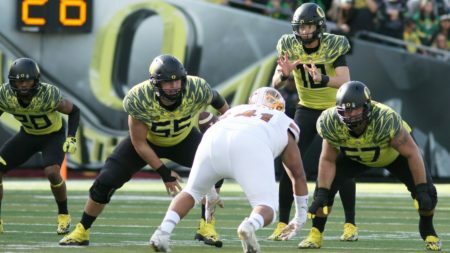 Justin Herbert’s return provides just enough Oregon offense against a porous Arizona defense and on the other side of the ball the Duck defense will keeps disciplined pursuit angles and slows Khalil Tate’s running threat enough for the Ducks to escape with a 44-42 win. Probably the Beaver’s best opportunity for a conference win in 2017. ASU becomes bowl eligible with a win and is favored by a touchdown. Given the state of the OSU defense keeping it to seven could be a challenge. ASU 33-21.